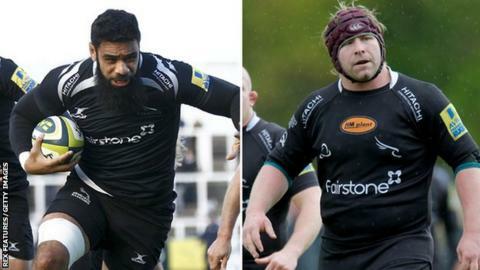 Jersey have signed former Newcastle forwards Uili Kolo'ofa'i and Oliver Tomaszczyk on deals until the end of the current Championship season. Prop Tomaszczyk, 28, will replace Italian Cosma Garfagnoli, who has been released from his contract after failing to settle in Jersey. Back-row Kolo'ofa'i, 33, was part of Tonga's squad at this year's World Cup. Wasps lock Will Rowlands, 24, has also arrived to begin the loan deal that was agreed back in June. As well as Newcastle, Kolo'ofa'i has also spent time at Italian club Cavalieri Prato and in France with US Colomiers. Tight-head Tomaszczyk was at Newcastle for three seasons, but most recently had a short spell in Wales with Ospreys. "It's exciting to have some new faces joining the squad," head coach Harvey Biljon said. "We know the Championship is a tough league and we've had more than our share of injuries in the opening weeks of the season, and it had been our intention to reinforce the squad once the Rugby World Cup was over. "Oliver and Uili have considerable experience which I expect to be of benefit to our whole squad, while Will is a player of great promise who I am looking forward to seeing in action - all three will be seeking to make an impact in our next set of games and create some additional competition for places." Meanwhile, Garfagnoli has left Jersey having played in just two of the club's eight matches. "Since arriving in Jersey in July, Cosma trained hard to fit into the squad and played in the Championship games against Doncaster and Bristol in September," Jersey chairman Bill Dempsey said. "He has found it difficult to settle in Jersey, and after talks with Harvey Biljon and myself, Cosma has been released from his contract. He goes with our best wishes, and we wish him every success in the future."